There is a part of me that will always be the hopeless romantic. A perfect morning for me is to walk or bike somewhere, get a delicious coffee and pastry, buy some fresh flowers, and grab that birthday gift for the party later, and it would be cool if that could all happen in one spot. Well, now it can with the opening of Flowerboy Project in Venice. It's exactly the kind of place I love ... I just never thought it would be on Lincoln Boulevard. Lincoln is of course on the rise, as businesses can't afford the ridic rents on Abbot Kinney (though Lincoln is not far behind), and very cool places like Nick Fouquet Hats, Golden State, Superba Bread, and The General Store have already totally upped the ante on the former rather eyesore of a boulevard. Flowerboy Project is now charming up the stretch of Lincoln anchored by Cafe 50's on the corner, and I fell instantly in love when I visited this week for the first time. Sean Knibb has lived and worked in Venice for 35 years, doing beautiful landscaping and raved about gardens and home decor for some of the most gorgeous businesses and residences through his Knibb Design (that also used to be based on Abbot Kinney, in the house where Pardee Properties is now). He wanted to do something new that incorporated all his areas of expertise, and Flowerboy Project was born, and opened for business in July. Inside the bright and welcoming space, you first notice the flower area. There is a bike in the corner (very Venice) and scissors and twine and paper for you to cut and create your own bouquet. I love that! You can be creative and selective and make exactly what you want out of their beautiful blooms that are delivered to them fresh from the Flower Mart downtown. You can get your coffee (from Vittoria) and your pastry (from Sugar Bloom Bakery), and your juice (from Clover Pressed Juice) and either take it to go with your fresh bouquet in your bike basket (my favorite weekend morning look), or have a little respite in the airy, minimalist seating area in the back. There are wonderful treasures (most from Alchemy Works and Apolis, based downtown) displayed on creative shelving units made out of metal ladders. Cool. Unique jewelry and art hangs from the walls, any of which might be just the perfect thing for those loved ones in your life that might be hard to find gifts for. They won't have seen these beautifully curated items anywhere else, I'll bet. The friendly staff was welcoming and informative (a refreshing change from some of the little brats working at some of the "hip" places around town these days), and seemed genuinely happy to be there. And why not? Interesting, creative people come in and out all day for nice things, in a manifestation of what Knibb envisioned Flowerboy Project to be ... a meeting place for both local and global people providing goods that are also both local and global. A right encapsulation of Venice, in one little spot. As it's a Knibb project, you will still see locals here (also a refreshing change), but you may also meet someone brand new that also likes cool places, and all these makings of a great day. I congratulated Knibb and took my stuff to go, as I'd envisioned. When I walked outside to leave, I noticed that the sign out front said "Organic Coffee - Cold Pressed Juice - Pastries - Flowers - + Things For Someone You Love". That's a perfect description of Flowerboy Project, a wonderfully welcome addition to the Venice family that is keeping with our tradition and love of all things unique, creative, and well, awesome. 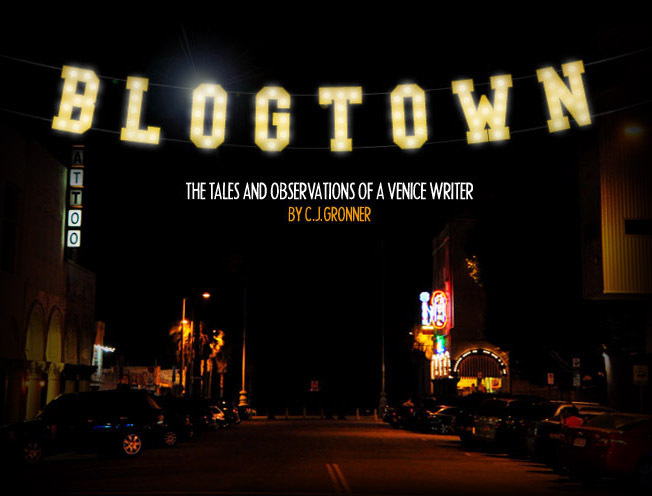 I love your blog, unfortunately I've been taiñted from "old venice". I know you have been toó! Keep it up. We are listening.